Retracing the cobblestone steps of my ingénue dreams. I’m running away to Europe my friends, retracing the cobblestone steps of my ingénue dreams. Only this time in John Fluevog ruby red slippers! What is she up to now you may ask? In my recent blog posts I’ve been sketching my past and sharing the process I went through as I followed my dreams to become a model and travel the world. I spent ten of those years living out of a suitcase, chasing the runway collections around the globe and gaining the utmost stylish inspiration from the geniuses – those designers’ I had the fortune to amuse. 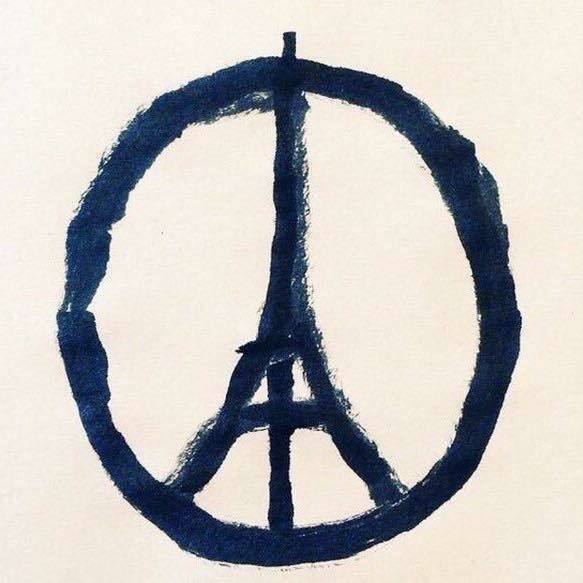 Those icons who have set the bar each designer must follow in the world today. And I have been forever touched and motivated by their dedication to the craft of creating beauty and gifting fashion to the world. 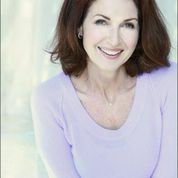 I had no idea those curious and innocent experiences would lead me to where I am today – with a fashion apparel line of my own on the horizon. With my Runway RunAway Collection® line of samples nearly complete and ready to be delivered this Thanksgiving weekend – I am feeling simply marvelous- retracing the cobblestone steps of my ingénue dreams, blessed and grateful for this miraculous life I am leading. Now don’t get me wrong – I am not naive…just because one designs a collection and produces as film doesn’t mean it will be and easy road ahead. In fact, this dream I have been working on has been a challenge over the past seven years since I graduated. When I say I am following my dreams – you better be sure that my dreams are sometimes “18 hour a-day-dreams” and that includes weekends too! The reason is because dreams evolve. They have lives of their own and that is why they are not for the faint of heart. Whatever you do while following the road to your dreams, just know there will be detours, ditches, confusion, a sense of feeling lost, lonely and sometimes even at a dead end. But if you just keep on going along the curvy road – you’ll find a beautiful, magnificent field of flowers; otherwise known as “Rumi’s field” where everything is exactly as it should be… in full bloom. You see Spirit doesn’t care if I become a fashion designer or make a fashion film – Spirit just cares that I did it – how I did it – and how I treated myself and others on the way. Dreams have timelines of their own too…so you won’t be seeing my collection until the summer of 2016 – but, in the meantime I will be producing this fashion film “Peau sur Peau ~ Skin on Skin,” with the award winning director, Robert E. Ball Jr. In fact, thanks to our sponsor’s: YBF Beauty CEO Stacey Schieffelin, Betty Badd Couture Jewelry, Felice Art Couture & Luxury Lingerie, Diamond earrings by Jewelry by Rosalina and executive producer Mr. Kent Cooper- we have already begun shooting the teaser!!! This weekend we will fly to Paris where Mr. Ball’s recent fashion film will be screened at the fashion film festival – A Shaded View of Fashion Film – ASVOFF-8. I will be reconnecting with the festival’s producer Diane Pernet, whom I haven’t seen in over 25 years. I modeled for Pernet’s couture collections in New York in the late 80’s and now her own “designer dream” has led her towards creating an international venue for fashion films at the Pompidou Center in La Marais. I can’t wait to see her again, and to connect with these talented filmmakers from all around the globe. And while we are in Paris we’ll continue shooting our fashion film –Skin on Skin where I’ll be following my own footsteps back in time… wearing a beautiful pair of ruby red slippers supplied by another one of our film sponsor’s – John Fluevog Shoes. Americans- shooting a fashion film in Paris…Another dream coming true! I hope you will join me as I continue my journey back to the United Kingdom too. As many of you know I spent those whimsical younger years, living in Chelsea with my long lost love Steve Clark. 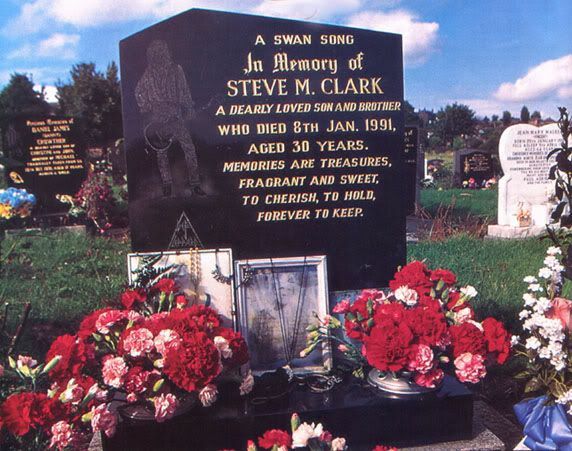 Steve came from Yorkshire and so I will make the trip to the north and visit his grave at The Wisewood Cemetery. It’s been nearly 25 years since our beloved Steve passed over – so it will be my tribute to him. Maybe some of you will meet me there and we’ll raise a pint at the Admiral Rodney Pub where we used to go with Steve’s family at Christmas. December 13, 2015 | MY BIRTHDAY! 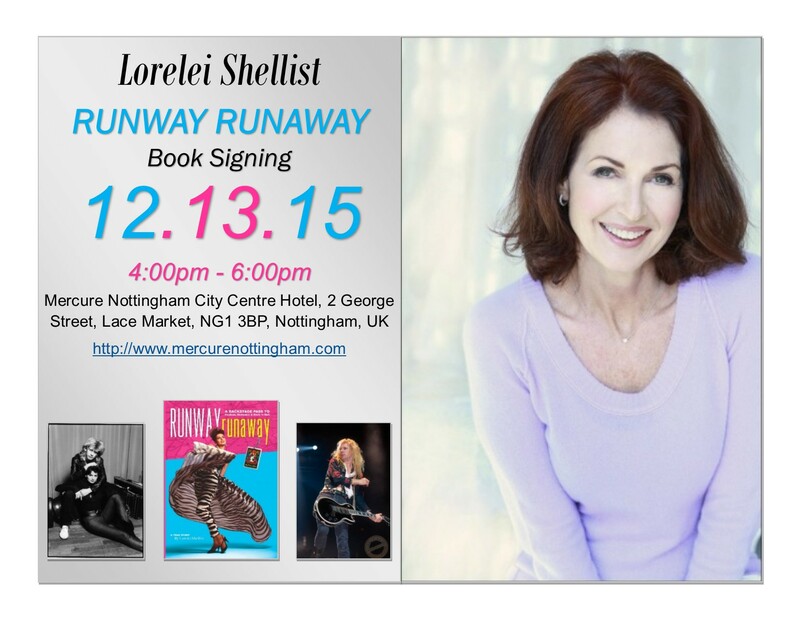 Runway RunAway Author & Book Reception 4:00pm – 6:00pm at the Mercure Nottingham City Centre Hotel in Nottingham, UK. I hope you will join me over the next couple of weeks as I am retracing the cobblestone steps of my ingénue dreams, remembering from where I came and observing where I am today as a result of my dedication to the dream. I encourage you to follow your dreams! I support you in cherishing and beholding the qualities of love, perseverance, strength of heart and courage to never give up – because you never know where the yellow brick road will lead you. Remember…Spirit doesn’t care whether you reach your goals or not…just that you had the gumption to try. To give yourself the permission to go for it and express yourself. To live your life beyond your wildest dreams.